The Lankhmar GM Screen is a full-colour, 3 panel, landscape format hardback screen, which comes with the 32 page full-colour adventure, The Eyes of Goro'mosh. 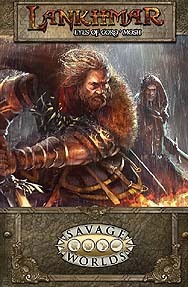 One side of the GM Screen features art by Grosnez; the other has all the tables and handy reference items a GM needs to play Lankhmar for Savage Worlds. The Eyes of Goro’mosh contains four Savage Tale adventures designed to be interspersed among other Lankhmar Savage Tales or those of the Game Master's own creation.